23-year old forward Douglas Valley (194-F-95) put on an extraordinary performance in the last round for second-ranked San Pedro T. and receives a Interperformances Player of the Week award for round 3. He had the game-high 20 points adding four rebounds for San Pedro T. in his team's victory, helping them to beat Belmopan B. (#5, 1-2) 81-69. San Pedro T. is placed at 2nd position in Belizean league. They would have been even better if they hadn't lost that single game earlier this season. San Pedro T. will need more victories to improve their 3-1 record. In the team's last game Valley had a remarkable six three-pointers out of 8 attempts. He has many years of experience at San Pedro T., through which he has constantly improved. Douglas Valley averages this season 6.5ppg. Second best performed player last round was Martevuius Adams (C). He is a center in his first season at San Pedro T.. In the last game Adams recorded impressive 22 points and 8 rebounds. Of course San Pedro T. cruised to a 81-69 relatively comfortable win over Belmopan B. (1-2). The season is still at the very beginning and this victory may help a lot. Let's wait for the next round. Adams is a newcomer at San Pedro T. and quickly became one of team's most reliable players. He belongs to the best scorers in the league with 18.3ppg (#6). He also registered 9.0 boards per game. Third place about best performers goes to guard Kris Frazier (201-PG) of Verdes (#3). 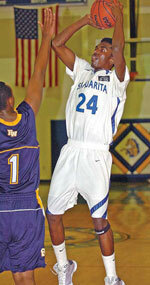 Frazier scored 14 points and grabbed eight rebounds. 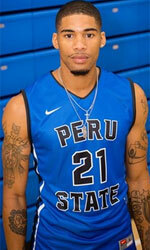 He was a key player of Verdes, leading his team to a 76-65 win against #4 ranked Smart Belize H. in a game of the week. Verdes needs these victories very badly if they think about getting closer to top teams. Their record at this point is 2 victories and 1 lost game. Frazier has a great season in Belize. After only 3 games, he made it on the list of the league's leaders in points with 20.0ppg (2nd best) and rebounds with 10.7rpg (2nd best).